High quality outdoor Trucks flags. Our Trucks flags are fully dyed for great outdoor performance. 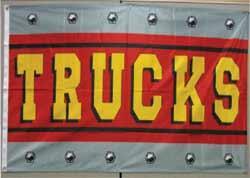 Trucks Flags are finished with a canvas header and two brass grommets. Knitted polyester fabric.